Why nokia selling c2 for low cost? Ans: 1) It's camera is not of any use because, normally all vga cameras take qcif videos(176*144 resolution with 15fps) but c2's camera will take very poor pictures and videos(sub-qcif 126*96 resolution with 10fps). 2) 64k color display with color depth of 16bits(normally 18bits and more in other low end nokia phones) so display is poor. 4) Noisy loud speaker, so annoying sound quality. 5) Mic quality will be poor. So c2seekers, be carefull because at any time it can get hardware problems..
V, 10 Sep 2010C2 is not yet available, even its user guide is not yet made available by nokia. why gsmarena ... moregood question, why? gsmarena put available. C2 is not yet available, even its user guide is not yet made available by nokia. why gsmarena already put it available? it will be a great phone, if nokia will come out with a bar type dual sim phone (dual active standby) that features a 5 mega pixel or more, 2000 entries in phonebook, expandable memory up to 32 gigabyte with micro sd card, number screening for messaging and calls, series 30 or 40 operating system (because these series have a larger font size that are readable), calendar, alarm. the size, shape, and appearance that looks like nokia e52 or nokia 6700. if this happen, this kind of phone will be selling like a hotcake in the philippines and other countries. Jeet biswajeet, 08 Sep 2010Hey guyes NOKIA C2 is available in market get go and take itC2 not released yet c1 has launched in the market. pls tell me if this phone has voice leakage problem. is this phone available/release in philippine market today? does it has a blacklist feature for calls and sms? can i use both sims at a time??? 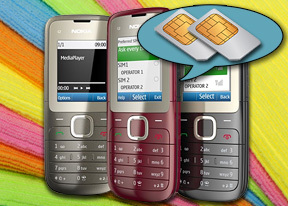 Hi dears plz reply.. IS this phone support gprs and 3g tecnology at both sim cards? Thn hw its performance and where it's available at tamil nadu.. Plz rply frnds..
Nokia c2 can support 3g files? it costs round 3500 inr. n da mobile seller said dat both da sims cant stay active at da same tym. who knows. w8in 4 ppls experiences. This phone looks good. i want to believe it will be far better than the C-1. What am seeing it is interesting. Total of 4664 user reviews and opinions for Nokia C2-00.